When moving, you need a team you can truly depend on and feel safe with, so you receive a hassle-free service that allows you to take the stress out of relocating. From packing materials to providing details of many reliable storage facilities, we proudly provide a friendly and helpful service for all your packing needs. Being highly recommended by our recent and previous clients, why not view some of our reviews which have been left on our testimonials page? Allow our professional team to move all your items into your new property as safely and as easy as possible. To see what we can do for your all-important house move, check out our house removals page HERE. For a fast and efficient move when relocating your business, rely on your local removals team! Offering a variety of commercial removals services, check out our page for further information HERE. Want to transport all your precious belongings as safely as possible when moving? 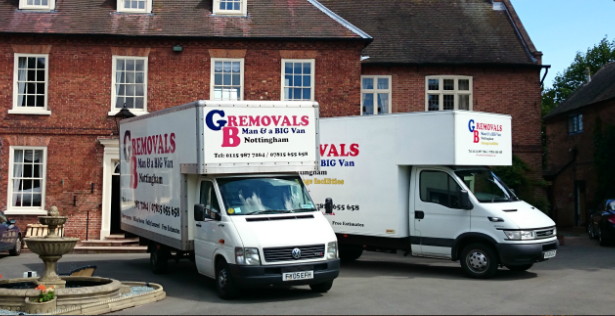 Please don’t hesitate to call GB Removals Nottingham on 07815 655 658 or 01159 877 264 and arrange your appointment, or get your FREE QUOTE today.